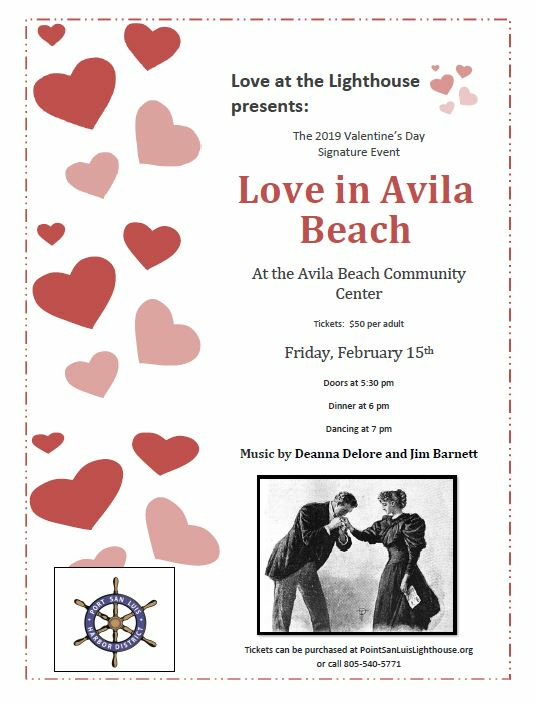 The Point San Luis Lighthouse Keepers invite you to Celebrate "Love in Avila Beach", a romantic evening filled with dining and dancing. Doors open at 5:30 pm at the Avila Beach Community Center. 191 San Miguel Street in Avila Beach. The Cash Bar includes wine and beer with a special sale of Lighthouse Labeled Wines. Dinner begins at 6 pm with Dancing from 7 - 9 pm. Enjoy the music of the Deanna Delore and Jim Barnett Duo - a jazz, pop, broadway infused act.